World's famous batch image resizer! ReMage Image Resizer is a free easy to use tool that can (batch) resize all images in a folder, literally with one single mouse click. Select the images you want to resize and the output resolution. Then, just press "Resize" button. For details please visit producer's web site now: www.soft.tahionic.com/download-painless . painless Image Resizer does not require being installed or uninstalled. Just download painless Image Resize and run it. Navigate to the folder where you keep your images. Press 'START' and the program will resize all the images in that folder. The original images are left untouched. painless Image Resizer is the only image resizer on the market than allows you to use 7 resampling filters: Box, Triangle, Hermite, Bell, B-Spline, Lanczos3, Mitchell. 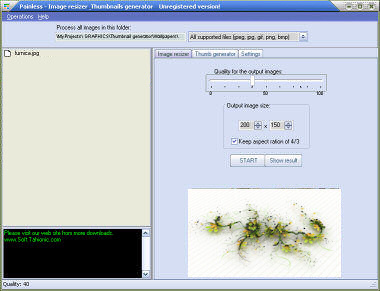 painless Image Resizer supports skins (all Windows platforms) and alpha transparency (only on Windows 2000, Windows XP or higher). Here are few screen shots. Convert video files to animated GIF and SWF. Beauty is a good image processing software. Create userbars, badges, and banners. Make great photo collages quickly and easily!